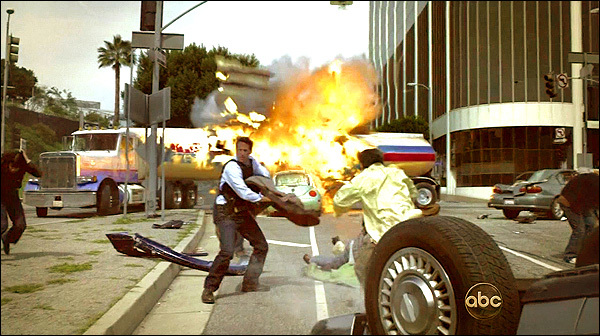 After the world regains consciousness, Mark pulls himself from his upside-down car and finds himself in a devastated city, where skyscrapers are ablaze, cars are overturned, and dead are strewn everywhere. Seconds after he stands up, an oil tanker truck explodes, sending fiery debris hurtling towards him. The photo above was shot at the corner of 4th Street & Beaudry Ave., with the camera looking northwest. 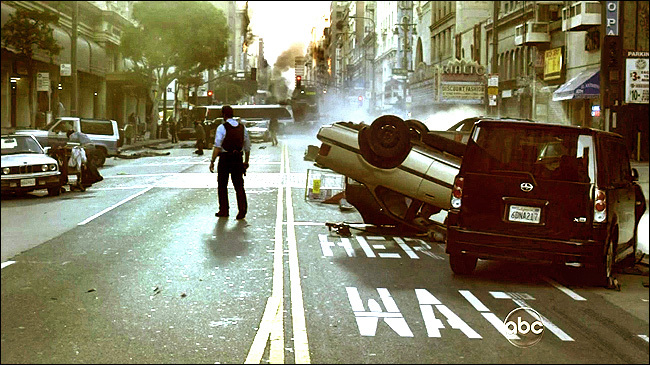 After the explosion, a burned-out car plunges down through a hole in street. That hole (surrounded by a railing) is a gap between the east and west bound lanes of the elevated 4th Street bridge, just east of Beaudry Ave. The camera is looking south/southeast. 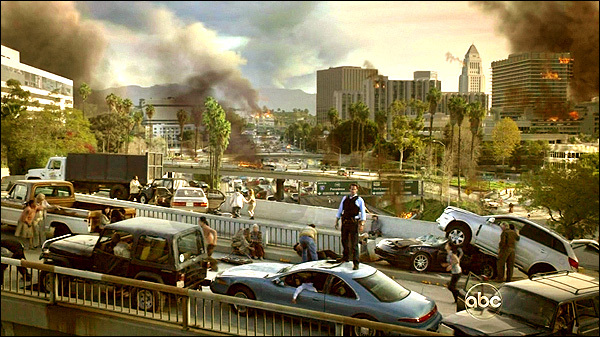 In the scene above, Mark runs to the middle of a freeway overpass, climbs atop a car and looks out over the chaos of a decimated city. 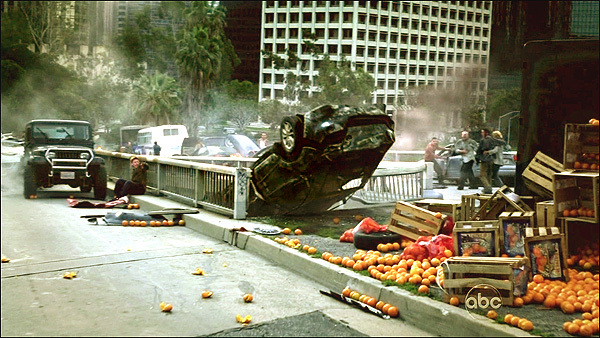 That shot above was filmed from the 4th Street overpass, above the Harbor (110) Freeway, with the camera looking south. That white building to the left is the Union Bank Plaza, at the southwest corner of Figueroa & 6th St. The shot below looks the other way, northeast (up the same 110 Freeway), showing Los Angeles City Hall (the pointed tower to the right, on 1st Street) and the Santa Monica Mountains on the horizon. CGI effects are, of course, responsible for the smokes & fires. 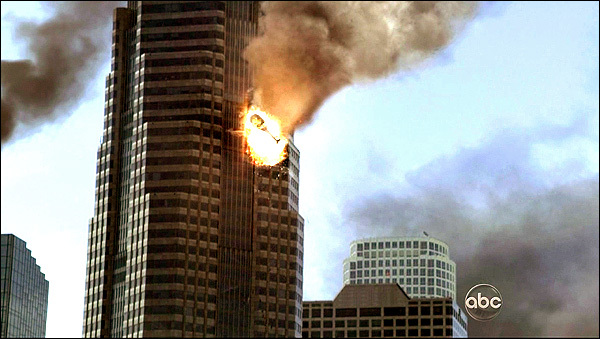 After Demitri rejoins him, and they help rescue some people, they look up to see a helicopter crash into the west side of a tall office building, explode into a fiery ball, then slide down it. 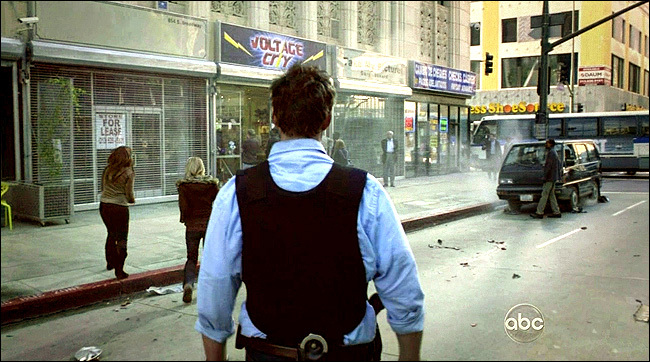 That is the Sanwa Bank building, at 625 S. Figueroa (the northwest corner of Wilshire & Figueroa), in downtown L.A.
After they arrest the suspect they were following, Demitri tells Mark to go find his wife. 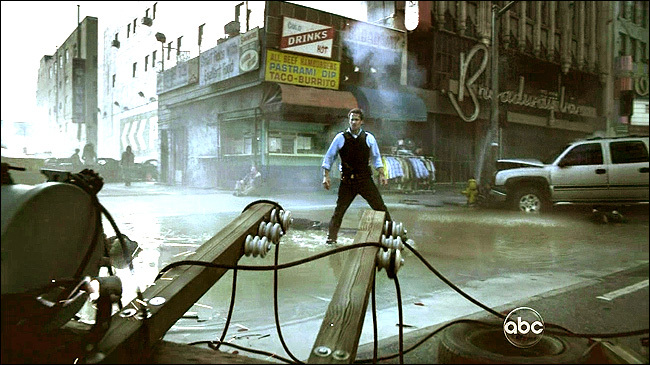 We see Mark running through an alley, and he emerges on a decimated downtown street, where a fallen power pole lies in the street, spitting sparks, and looters carry away their ill-gotten gains. That alley we saw him running down is actually a parking lot between buildings, at 826 Broadway, on the east side of Broadway, in downtown Los Angeles - and he was running west, from Spring Street. That parking lot is just north of the Broadway Bar (seen above on the right) which is at 830 Broadway. As Mark wanders about the devastated city, observing the chaos, we see him above, still on Broadway. But this time, the camera is looking north/northwest up Broadway. You can see the marquee of the old Rialto Theatre on the right side. The Rialto is located at 812 S. Broadway, in downtown. Broadway was once the center of the city's theatre district, the home of numerous expensive movie theatres, lavish cinema showcases that drew huge crowds back in the 1920's & 30's, when downtown was the place to be. As focus moved away from downtown, the area degenerated over the years, and (with a few exceptions) most of the historic theatres have been neglected or lost. The traffic lights seen in the photo above are at the intersection of 8th & Broadway. A number of large, military helicopters are spotted, flying extremely low, just above the street. In the photo above , Mark watches as the copters head south down Broadway, just south of 9th St. 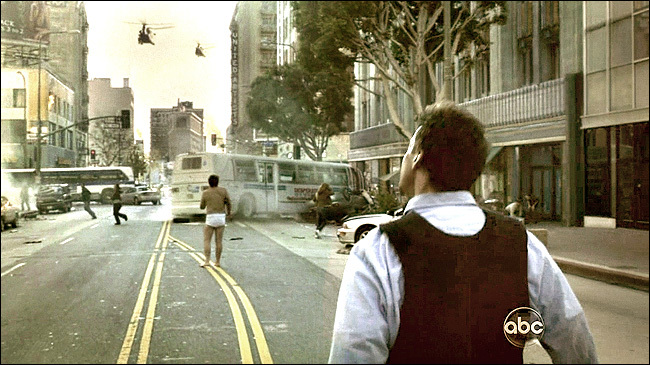 The 'copters, of course, were added later via CGI. 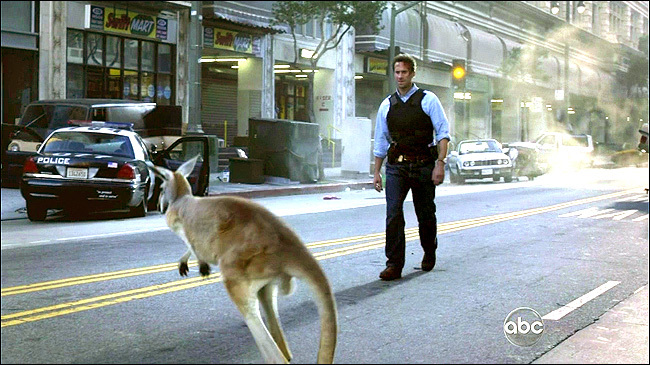 In one of the more surreal and memorable moments on the show, Mark sees a live kangaroo hopping down the street. This was shot from more or less the same spot from which he watches the helicopters. But this time, the camera is looking northwest, at the west side of Broadway. The "Swift-Mart" signs, seen in the background of the photo above, appear to be fake. Those storefronts actually house the Broadway Grill, at 831 Broadway. Mark spots a small crowd gathered outside an electronics store called "Voltage City", looking in the windows. When he goes there, he sees that they are watching new reports on TVs in the store window. 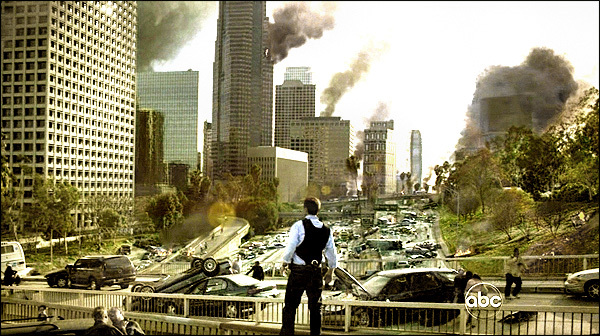 It is then that he learns that the disastrous blackout wasn't limited to Los Angeles, that it was worldwide. The "Voltage City" sign is fake. It's actually an empty storefront, at 856 S. Broadway. It's on the east side of Broadway, just north of 9th St. 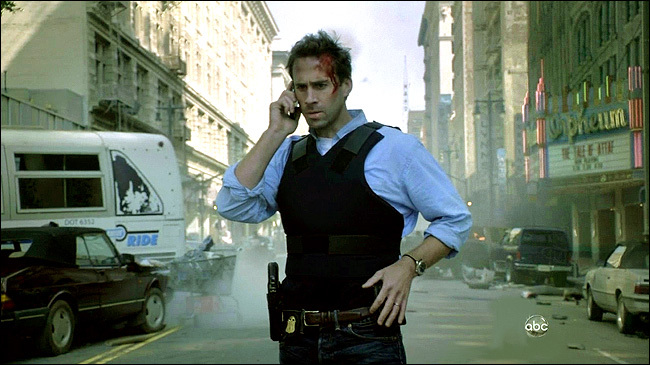 Finally, Mark finds out that his wife, Olivia, is OK, when she calls him on his cell phone. The camera is looking north up Broadway. Finally, one recurring location on the show is the FBI headquarters where Mark works. 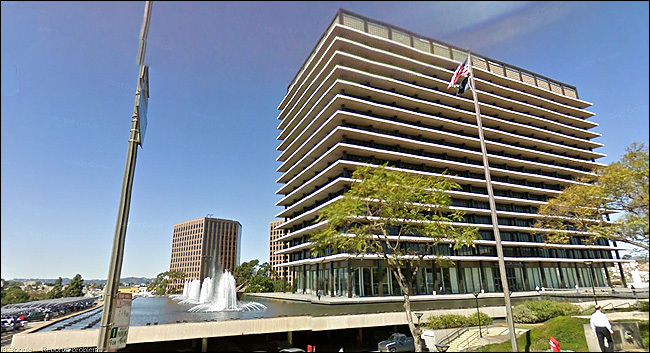 That interesting building is the Department of Water & Power building (now called the John Ferraro building), at 111 N. Hope Street, in downtown Los Angeles (which helps explain the moat & fountains). That's a few blocks west of City Hall, and right across the street from (west of) the Music Center.